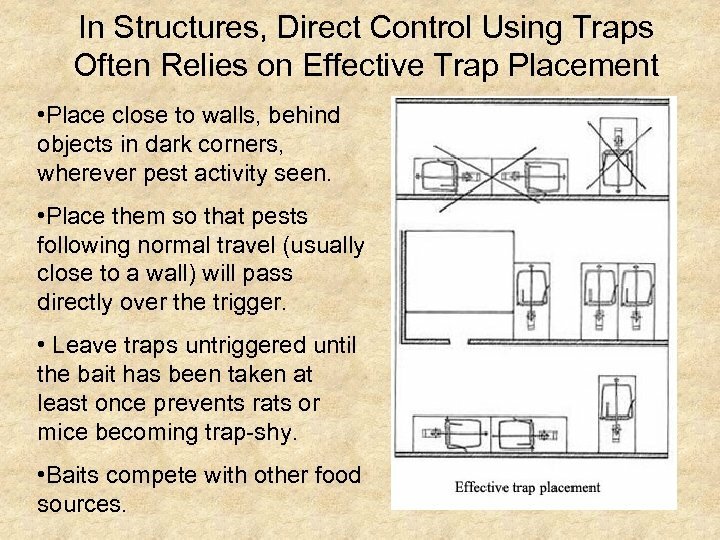 In Structures, Direct Control Using Traps Often Relies on Effective Trap Placement • Place close to walls, behind objects in dark corners, wherever pest activity seen. 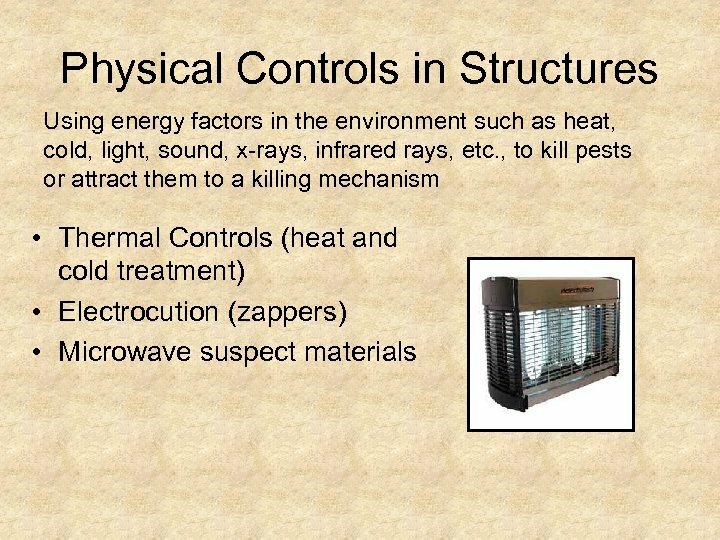 • Place them so that pests following normal travel (usually close to a wall) will pass directly over the trigger. 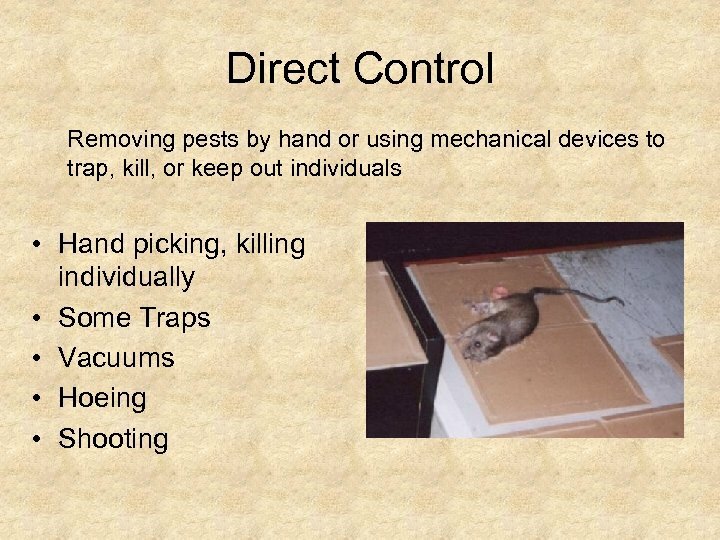 • Leave traps untriggered until the bait has been taken at least once prevents rats or mice becoming trap-shy. 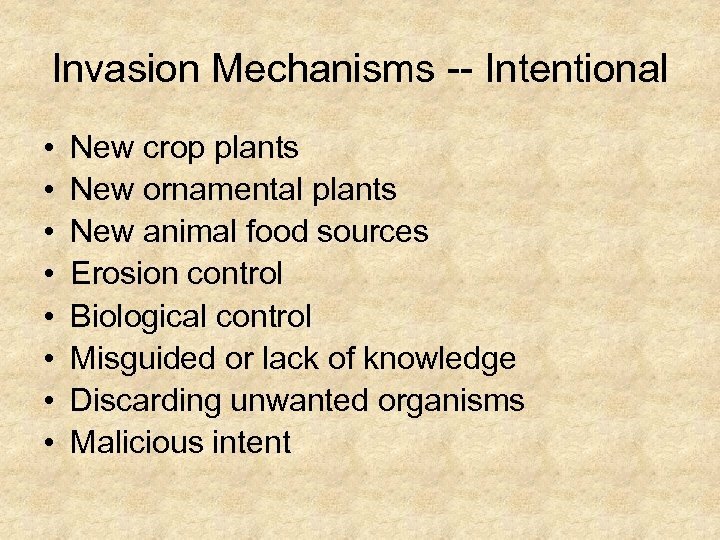 • Baits compete with other food sources. 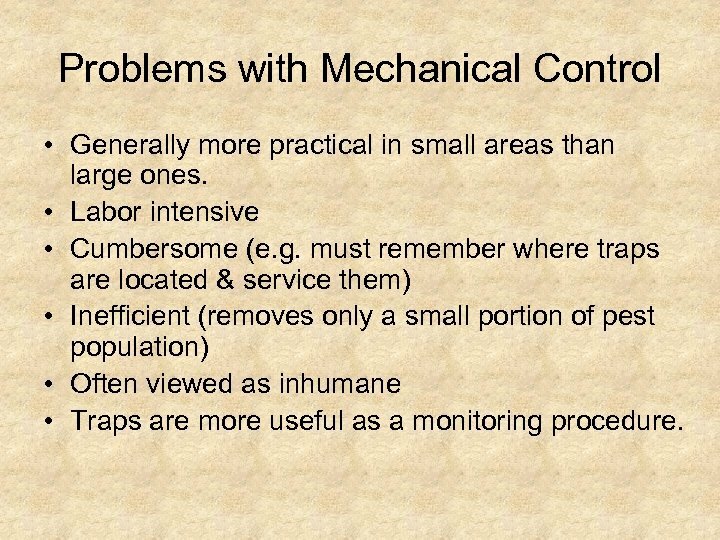 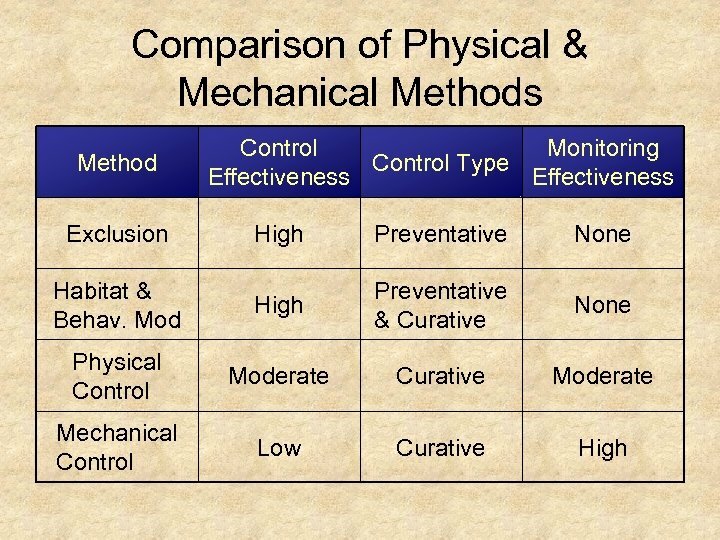 Problems with Mechanical Control • Generally more practical in small areas than large ones. 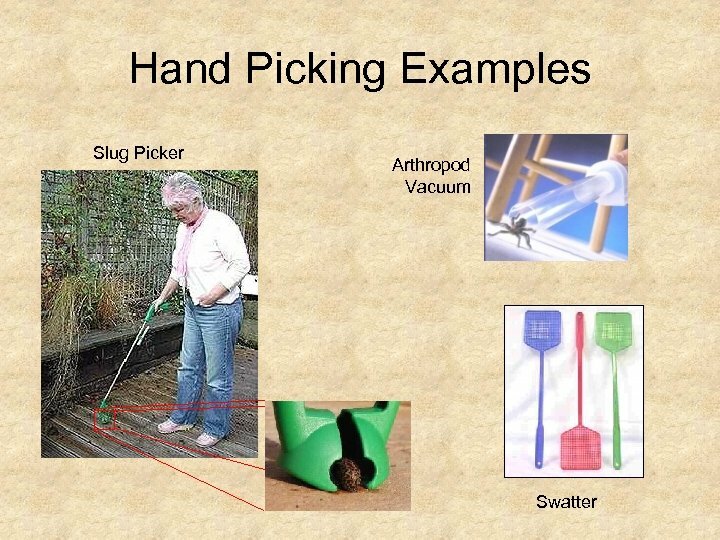 • Labor intensive • Cumbersome (e. g. must remember where traps are located & service them) • Inefficient (removes only a small portion of pest population) • Often viewed as inhumane • Traps are more useful as a monitoring procedure. 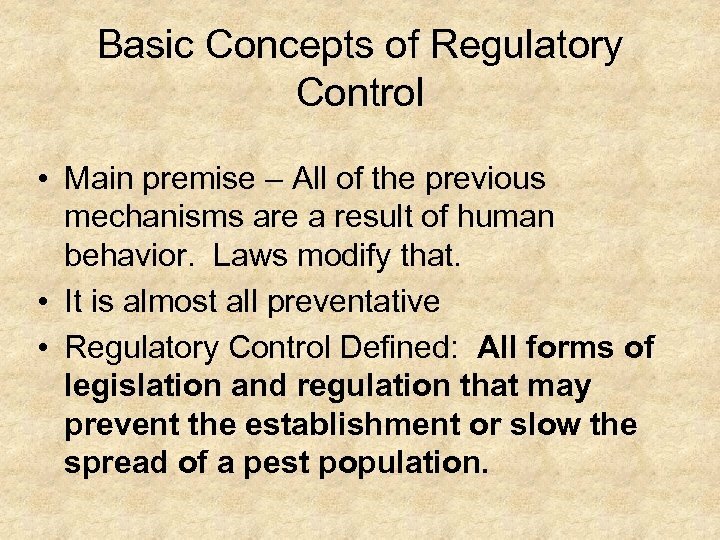 Basic Concepts of Regulatory Control • Main premise – All of the previous mechanisms are a result of human behavior. 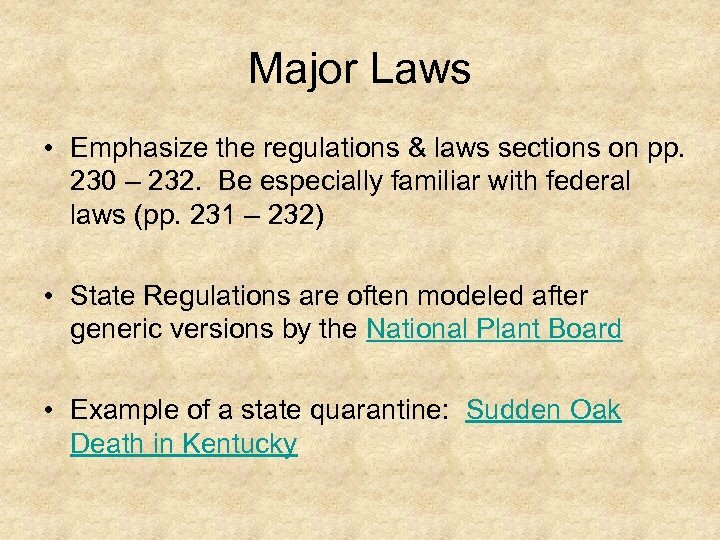 Laws modify that. 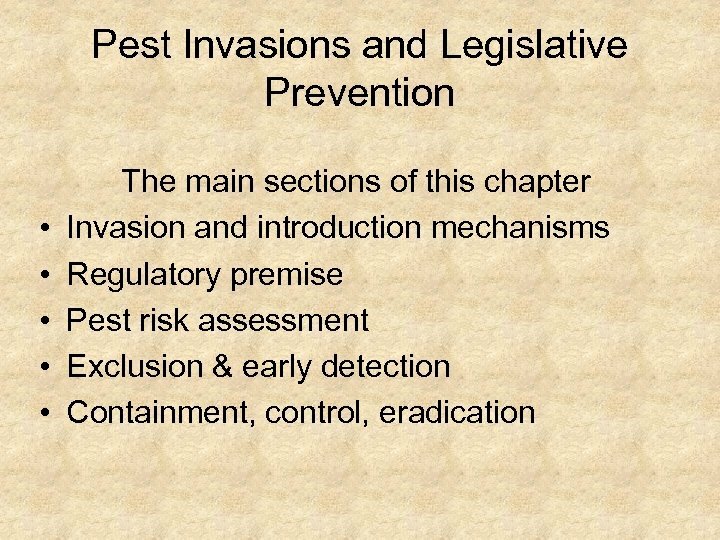 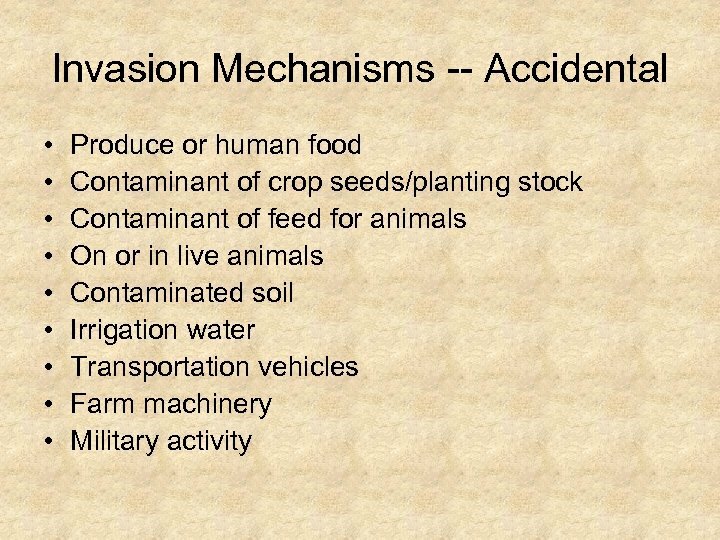 • It is almost all preventative • Regulatory Control Defined: All forms of legislation and regulation that may prevent the establishment or slow the spread of a pest population. 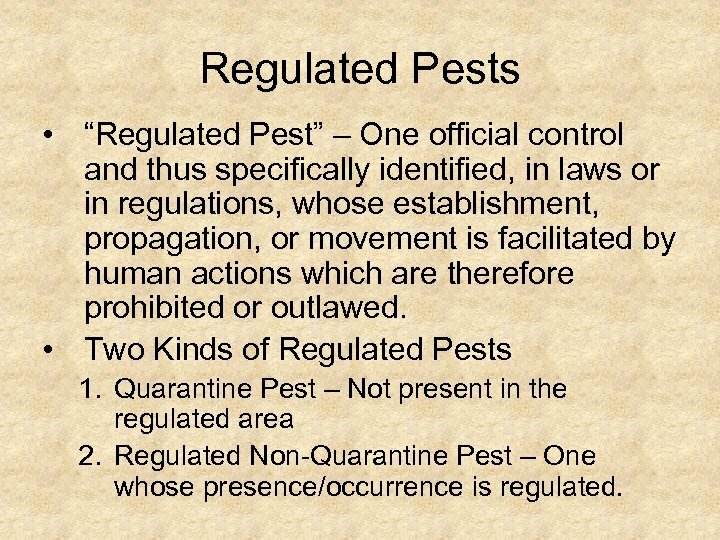 Regulated Pests • “Regulated Pest” – One official control and thus specifically identified, in laws or in regulations, whose establishment, propagation, or movement is facilitated by human actions which are therefore prohibited or outlawed. 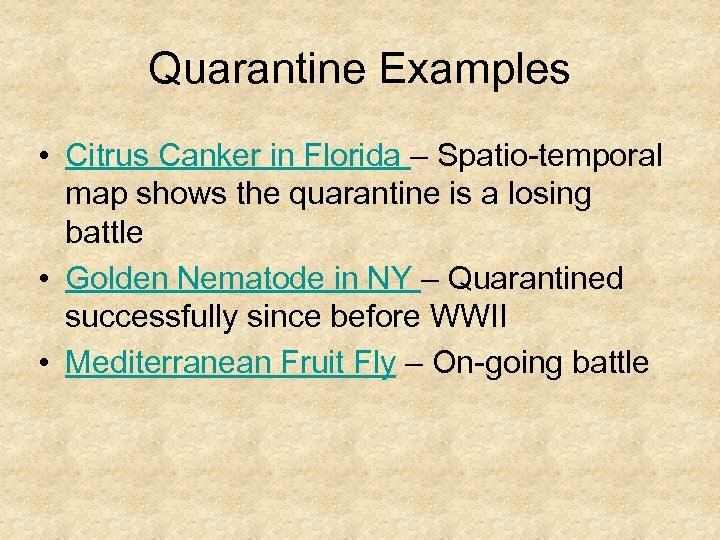 • Two Kinds of Regulated Pests 1. 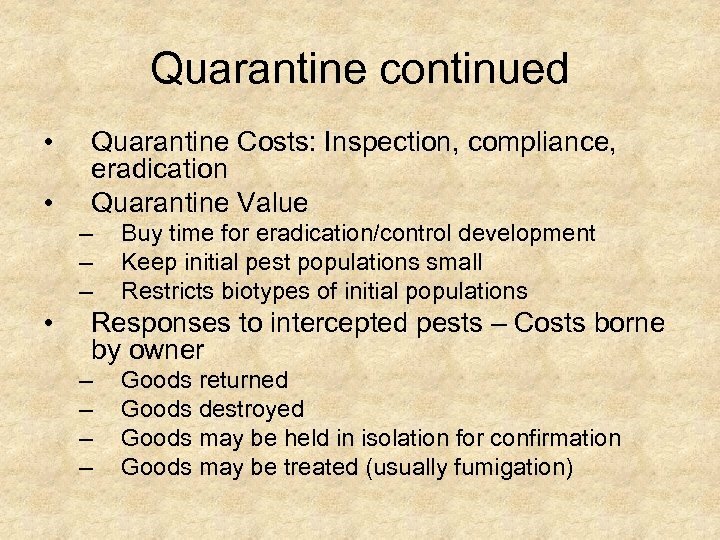 Quarantine Pest – Not present in the regulated area 2. 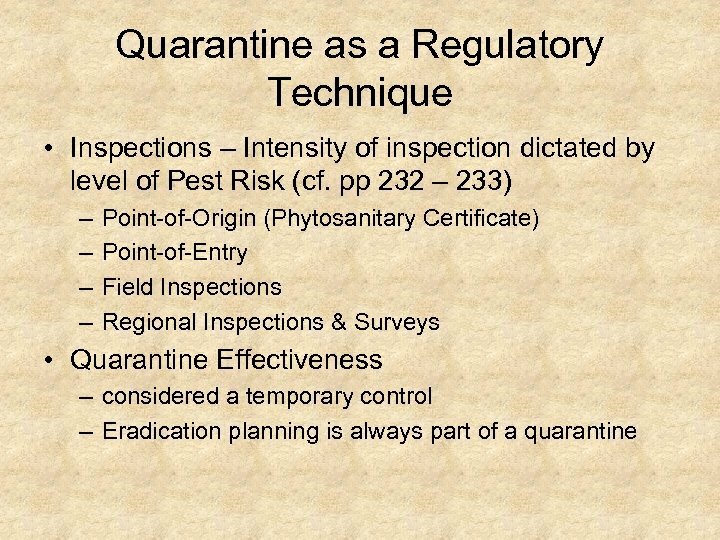 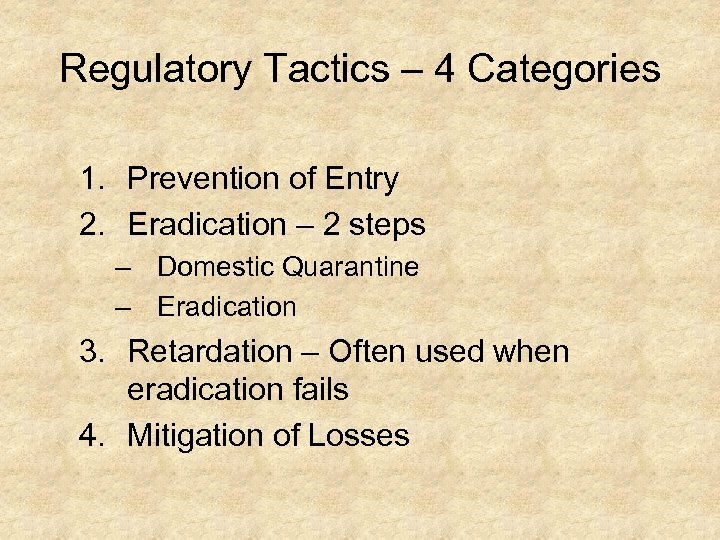 Regulated Non-Quarantine Pest – One whose presence/occurrence is regulated. 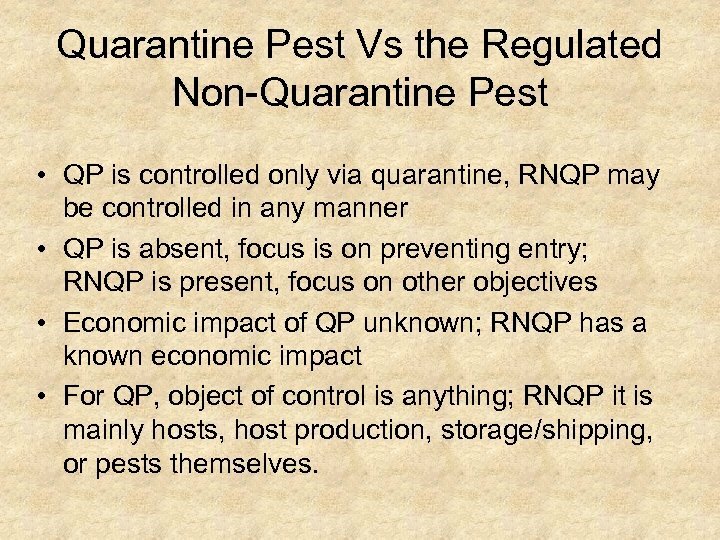 Quarantine Pest Vs the Regulated Non-Quarantine Pest • QP is controlled only via quarantine, RNQP may be controlled in any manner • QP is absent, focus is on preventing entry; RNQP is present, focus on other objectives • Economic impact of QP unknown; RNQP has a known economic impact • For QP, object of control is anything; RNQP it is mainly hosts, host production, storage/shipping, or pests themselves.